In his third book Ray Davies looks back on two important periods in his life. One in his career and one in his personal life. At the time where the book starts the first part of The kinks' career is, just about, over. The 60s stream of hits is drying up up. The U.S. ban that lasted from 1965 till 1969 is lifted. A new record contract was signed and the band decided it was time to conquer the U.S. Step by step the band succeeds. More as an all over theatre act than a full fledged rock band, The Kinks grow bigger and bigger by the album. Of course there ís 'Lola' in 1970, that worldwide monster hit, while in fact the song is the odd one out. The last of the huge hits in Europe and The Netherlands. From now on there are concept albums or rock operas nearly exclusively. The Preservation albums, 'Soap Opera', 'Schoolboys In Disgrace'. Tour after tour after tour and slowly everything starts breaking at the fringes of the band. Marriages lay by the way side. Drummer and guitarist fight ever more. Members deciding to choose for their private lives and not the band. People in the entourage dying of terminal illnesses. In Europe the Kinks seems to slowly fade from memory, never really to recover. For a band that, with The Who, is in third place firmly where 60s U.K. bands are concerned, this is a mysterious, unexplainable place to be. Ray Davies continues, losing himself along the way more and more. With the change of record label in 1977, the band concentrates more on individual songs once more, is coached better it seems by the record label and its owner. Slowly The Kinks gains more ground once again and is on route to score U.S. hits and albums. With the 'Low Budget' album (1979) the band moves into arena's and bigger, becoming one of the great rock bands in the U.S. Again things deteriorate within the band itself. With lesser albums from the second half of the 80s onwards, it all collapses in the mid 90s with a fantastic self-produced acoustic album, 'To The Bone'. The last show is somewhere in Norway in 1996. Ray Davies goes solo with his storytelling. The other half of Americana focuses on Ray Davies' period in New Orleans ending in being shot in the first days in the new year of 2004. 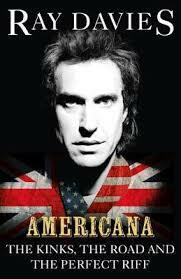 The fact that I hadn't heard anything about that until the 'Americana' album in 2017, tells something about how far from memory Ray Davies had faded in this country in 2004. Working on ideas for his first solo album, but with his soul under his arm, Davies is lost. No band, no marriage, his youngest daughter with her mother in Ireland, no sense of home. The casualty of the road Ray Davies had become is looked at with remorseless insight as he lands himself in New Orleans. In search of himself in a doomed relationship and casting out for things that make sense to do. Leading to being shot in a street robbery in the wrong place at the wrong time and where most likely a cab would have been the right place in all circumstances. The medical complications after the shooting all come by, including the long recovery towards his first solo album, to be released in 2006 only, 'Other People's Lives'. Long after I have closed the book in 2004. The message I took from the book is another one. The Kinks went on for too long. If the band had gone into a hiatus of four or five years, say after 'Word Of Mouth', like The Rolling Stones more or less did, the band would have reached that famed status of "will they ever perform again"? To keep reaping for 30 years onwards. Everyone involved would have been older and perhaps wiser. In Europe somehow the band lost everything, most likely as the result of focusing nearly exclusively on the U.S. That still does not explain why compared to most other 60s bands, The Kinks come by so much less on the radio. The hits are superb, superior. There is no other word for it. And they are not there. The uncertainty and yearning for recognition I registered in Ray Davies' shows in the 00s sort of is explained in this book as well. It seems Ray Davies does not believe in the true strength of his songs or yearned for recognition too much, instead of making the songs do the work for him. They can, without effort. This uncertainty comes forward throughout this book. A book that is straightforward and written well enough. Ray Davies is an entertaining causeur. I can imagine sitting around the hearth listening to his stories spell bound. A few times he skips a topic too easily -Hey, what did really happen here or Give me some more details, please. Perhaps that is for biographers and not himself to tell. The book would also have been a perfect stepping stone to the albums, if I hadn't found out about the book after the second album. So be it, it's time to read 'X-Ray', his first book. In my reviews of 'Americana part I and II' I mentioned that Ray Davies seemed to have, perhaps finally, resigned himself to what and who he is. That there is nothing left to prove as he has done it all, so was able to come with two great and dignified albums. I hope that is the case as he has proven it all, time and again. In his music and in his books.